We are finally home, after 3,600 miles on the road in two weeks. Sandy and I traveled to Valley Forge, PA, to attend the Woodworking in America conference. Following the conference we drove into the Western part of Connecticut, Massachusetts, and Vermont, a region commonly referred to as New England, for all readers not in the United States. And now the job of cataloging photos of our trip begins, to make some order of the conference, the miles, the gorgeous views, and the wonderful people along the way. I cannot find any reference to a similar drawer – I don’t have the resources, or the knowledge to find the information quickly, as I would like to try this look in some test drawers. And searching the Internet has netted exactly zero results. I love the look of this joinery, but I am having trouble deciding whether this is just a variation of a rabetted side on the drawer front. Also, since every part of the joint is pinned/pegged, are the pegs likely the main fasteners, or are they mostly decoration? Are the pegs likely to be glued in place? And how is this joint made? 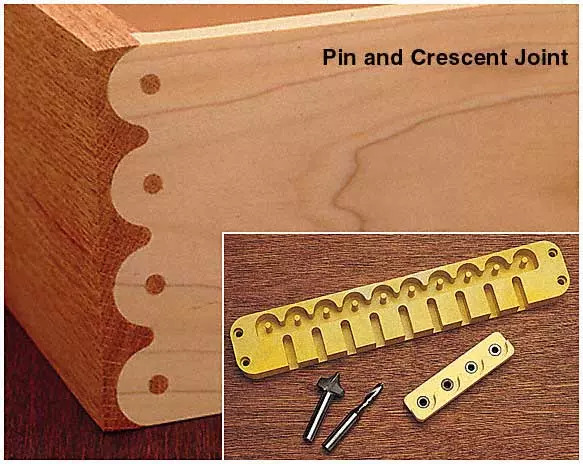 I can see myself today making the half-rounds using a Forstner bit on the edge of the drawer front, but how would you make the perfectly-matching contour on the sides? Was this all made by hand? I look forward to some enlightenment from readers who might know the answers to my questions. It’s a bit out of my time period but from what I remember, this joint showed up in the late 1800’s or early 1900’s. It’s a fully mechanized joint. There’s actually a machine that cuts the rounded part with a pin integrated into the drawer front. I’m not sure if it’s a separate machine or just on a different part of the same machine that the drawer sides are cut with the rounded shape and the holes drilled. I know I’ve seen the joint on a fair number of pieces from the early 1920’s. I know it’s not specifics but I hope it helps a bit. Thanks, Chuck. Accurate description all around! It helps very much, as it confirms that the pins are an integral part of the drawer front – and machine-made using a jig over 100 years ago!